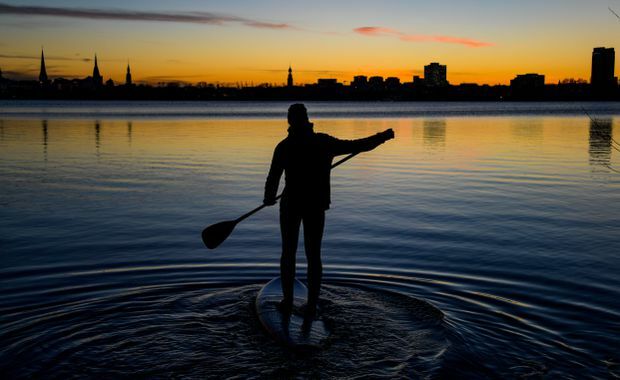 A stand-up paddler guides his board through the water at the Outer Alster Lake in northern Germany in January, 2018. For me, the opportunity to get outside in a serene natural setting prompted me to pick up a used kayak in an end-of-season sale a few weeks ago. A few months ago, I rented a canoe to take my daughter paddling on the Humber River, two blocks from where we live in Toronto. As we drifted among the lily pads watching beavers swim and turtles sunbathe, I noticed a determined-looking kayaker zoom past several times, working hard. The seed of an idea took root in my mind. I’m a long-time runner, but I’m well aware that running isn’t the only form of exercise I need. It doesn’t use my arms, chest or back. Beach-body dreams aside, I want to be robust enough to, say, push myself out of a chair a few decades from now – so I need to use my upper body. Over the years, I’ve spent plenty of time hoisting weights in the gym and doing pull-ups in the park. But it’s always felt like a chore. So I decided to look into the potential fitness benefits of paddling. Here’s what I found. You’ve got two basic choices to propel yourself on the water. You can paddle a canoe, kayak, dragon boat, or stand-up paddle board, which means you’ll be holding a freely moving paddle and moving forward through the water. Or you can row, with an oar attached to an oarlock, moving backward. In general, paddling sports depend primarily on the upper body – the trunk more than the arms, if you’re doing it right. The legs, according to a recent Swedish study, contribute only about 20 per cent of the force required for kayaking. Rowing, in contrast, is dominated by the legs thanks to a seat that slides back and forth. That makes paddling a more tempting choice for me. At the recreational level, paddling and rowing are primarily endurance activities, sustained for long periods of time. On the plus side, that means they’re great for aerobic fitness. An Australian study found that just six weeks of stand-up paddle boarding three times a week improved VO2max, a key measure of cardiovascular health, by 23 per cent. But realistically, the level of resistance on each stroke isn’t high enough to trigger significant muscle growth. One way to tweak the balance: sets of high-intensity 30-second sprints will work your muscles harder and build your explosive power, according to a study of kayakers published by researchers in Greece earlier this summer. Water is even tippier than a balance board, as novice canoeists often discover to the amusement of onlookers. That makes paddling a great way of improving your balance. In particular, a Brazilian study published earlier this year found that older adults who tried stand-up paddle boarding improved their balance back on dry land, which suggests the benefits are transferable to daily life. A study of Oxford University’s storied rowing team found that a workout of 45 minutes on a rowing machine, alone in a room, boosted their pain tolerance. But doing the exact same workout when they were all in the same room (but still on separate machines) boosted their pain tolerance by twice as much. Something in our brain chemistry, the researchers suggested, responds to the social bonding of synchronized teamwork. It’s more than just the presence of other people. One study found that cancer survivors who joined a dragon boat program had higher attendance and a greater sense of team cohesion than those who joined a group-based walking program, perhaps motivated by the sense of shared goals. In the end, the specific form of paddling that’s right for you will depend on your goals and situation. For convenience and year-around access, it’s hard to beat the rowing machines found in most gyms these days. For me, the opportunity to get outside in a serene natural setting prompted me to pick up a used kayak in an end-of-season sale a few weeks ago. I’m hoping to get on the water once a week for five or six months each year. And I’ve already made an important discovery: Even if paddling the boat doesn’t qualify as heavy resistance training, carrying it two blocks to and from the river sure does.